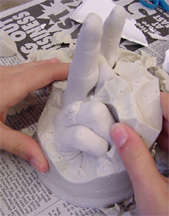 These pictures show the first plaster cast hand of the 2001-2002 school year using dental alginate as the mold-making material. This piece was created by a senior as part of an independent study. In the spring of 2002, advanced art students had the opportunity to do this project during a unit on sculpture. 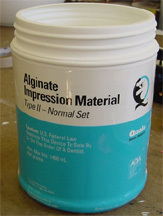 We used two different kinds of dental alginate. The first was ordered from a dental supply company, and the second (pictured below) was ordered from Douglas and Sturgess, Inc..
A 32-ounce styrofoam cup was used as a container for the mold, and each casting required about 16 ounces of alginate. I used an 8-ounce yogurt cup as a measuring device and did not pack or level the powder. I added equal parts of cold water to the powder and mixed it--in a bowl--with my hands. A little extra water was added to make it a smooth consistency. I poured about one inch of the mixture into the bottom of the styrofoam cup before students placed their hands in. Their hands should not touch either the bottom or the side of the cup! 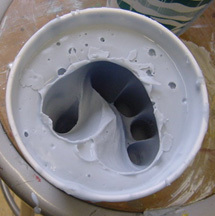 Pour the alginate mixture evenly around the hand, leaving about one inch of space at the top of the cup. Gently tap the sides of the cup to release air bubbles from the alginate. 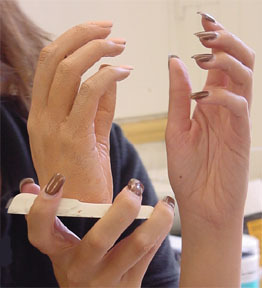 Students initially held their hands straight down, but as the alginate set and became rubbery in texture, they could move to a more comfortable position, as long as their hands remained still. I began mixing plaster of paris according to package directions as soon as the alginate began to set up in the cups. After 10-15 minutes, students slowly and carefully removed their hands. We immediately poured in the plaster, filling the cup to the rim. 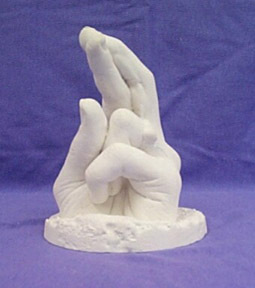 (This allows the hand sculpture to have a plaster base.) 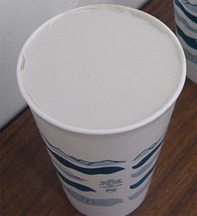 The sides of the cup were again gently tapped to release air bubbles, and then the casts were set to dry overnight. 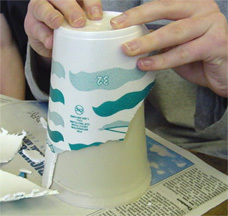 When the plaster had dried, students gently turned the cup upside down, slit the styrofoam on one side, and began peeling away the cup and the alginate. It was exciting to see their hands emerging from the mold material, and they were amazed at how well the dental alginate had captured every subtle detail of their jewelry, fingers and hands! They could leave their hands white (sealing with a clear acrylic spray) or paint them any way that they wanted. 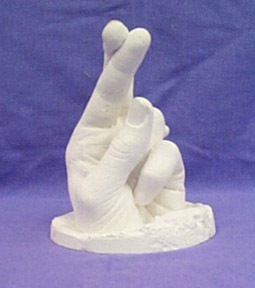 Click here to see some of the finished cast sculptures!